I needed to make a dozen packets and I didn't have a lot of time to make them, so these were perfect! Since the original project was made by Connie several years ago, many of the products used are retired, but with some creativity, these could easily be made with items available in the current catalog. I tweaked a few things from the original to include the woodgrain stamp and sentiment but overall I stayed true to her design. Here is my completed stash. It was fun to give these away. Such an easy way to make someone smile.I consider myself incredibly fortunate to work with such great people. I wanted my sentiment to reflect that I truly am grateful for them! I have had jobs in my life where giving something like would not be an option, but not this one! Have an awesome day...stop by again soon! 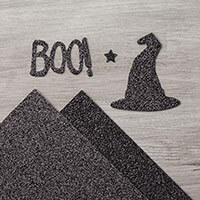 I've been stamping and crafting for a long time and while I enjoy creating cards and 3-D items for various occasions, I'd have to say that Halloween is probably one of my favorite. I don't do a lot of decorating around the house or have my front yard covered in Halloween-related lawn ornaments, but crafty things have my full attention. Over the next couple of days I'll be showing some of the things I've done lately. Today we'll start with the card. Several times a year I swap cards with other fellow Stampin' Up! Demonstrators to share ideas or to show our customers. This card features several great new products in the Stampin' Up! Holiday Catalog. 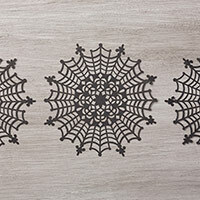 It's hard to for me to pick a favorite new product because this catalog is jam-packed with them, but there's something about black spider web doilies that just make me happy. What's even better is that 24 of them come in a pack! These doilies are not just for Halloween. I'll be posting other projects using them in the near future. 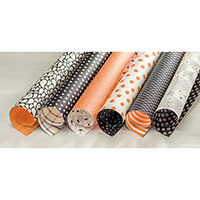 A listing of the new products used is listed below. 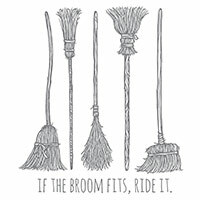 The stamp set is called If the Broom Fits and I can't help but smile every time I use it. Come back tomorrow to see the candy treats I made for some of my co-workers. They make such a great gift for anyone!